Brace yourselves for one of the weirdest days of analysis we’ve seen in this election cycle, as pundits and pollsters parse the political effects and meanings of Hurricane Sandy. A major natural disaster one week before the election is the one thing the campaign season lacked to make it truly harrowing. The fact that high winds, driving rains, and surging seas are even now imperiling lives and physically rending the fabric of the nation isn’t going to deter anyone from spinning the storm. On the contrary, the timing of this freakish event, coinciding as it does with Halloween and a full moon, seems intended to arouse our interpretative instincts, sending an unnerved body politic on a quest for cosmic meaning. Don’t be too surprised if the lines of analysis fall mainly along party lines. My own first reaction was essentially a pro-federal one. Disasters, whether natural or man-made, bring out our natural sympathies, heightening our sense of interconnectedness and reminding us of the bonds that have long knit us up into one political body. Disasters arouse patriotic and charitable feelings, prompting us to value customs and institutions that protect us collectively while enabling us to repel threats from outside. I imagine President Obama benefiting from the gratitude and relief that a threatened and vulnerable populace feels, when it rediscovers the national government as a source of safety and strength. Yes, Sandy could really benefit the Democrats—as long as all those East Coast voters can get to the polls. Yet the historian in me can readily envision how Sandy could be spun from the other side, by the more religious, evangelical side of America that has a tendency to see natural disasters as divine judgments, expressing God’s displeasure with wayward man. Are there, in some far reaches of our country, fundamentalist voters unaffected by the storm, rejoicing in an event so perfectly designed to cast Democratic strongholds into confusion and deliver an electoral victory to the other side? At the end of a hard-fought campaign in which Republican forces have seldom been confident of a preponderating victory, is it possible that this massive storm, crippling the northeastern corridor and its media, has given them the lucky break that they so desperately need? Between professions of sympathy, Republican operatives will be doubling down in the hope of churning meteorological chaos into political victory. At the end of this long campaign season, when every American is being called on to get involved and work to secure partisan victory, the storm is at the very least a reminder of vast impersonal forces at work, and of the maelstrom that American democracy is today. Sandy may have passed over, but sit tight: we may be in for more stormy weather next week. 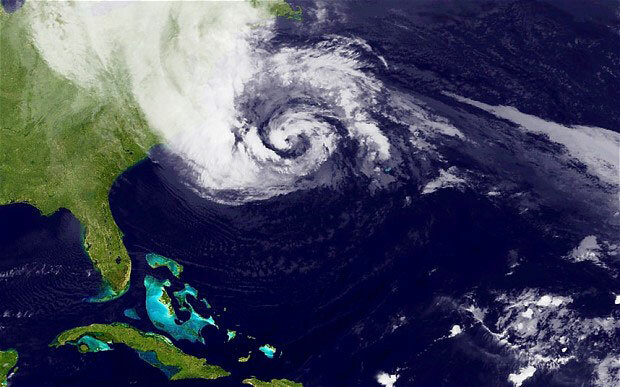 Image: Hurricane Sandy over the eastern US, from this source.